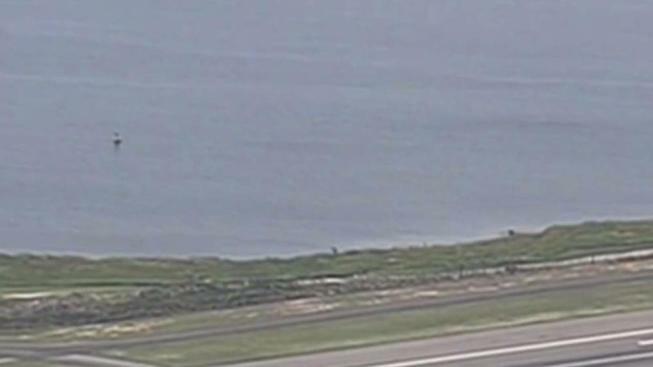 Authorities are investigating how a missing man from Virginia ended up in what's supposed to be a secure area of Kennedy Airport, soaking wet on a runway after he allegedly swam across Jamaica Bay, law enforcement sources tell News 4 New York. Mark Mogensen, who's in his early 20s, was reported missing from a mental health facility in Sterling, Virginia, that he'd entered voluntarily on July 14. On the morning of July 16, Port Authority police officers spotted Mogensen, wearing a shirt and shorts, completely soaked, on a runway at JFK Airport, the sources said. When the officers asked Mogensen how he'd gotten there, he said he swam across Jamaica Bay and climbed a perimeter fence. That fence, part of a multi-million dollar security plan, is supposed to be secured with alarms, radar and cameras. Police ran his name through a national FBI database and learned he was reported missing in Virginia. It's not clear how he got to JFK from Virginia. Mogensen was arrested on a charge of criminal trespassing in the third degree. The Port Authority said in a statement it's investigating the trespassing incident and reviewing the perimeter security measures. The multi-million dollar perimeter fence has come under scrutiny after recent breaches. "We have already identified some enhancements to our physical security measures and based on the findings of this investigation," the Port Authority said. "We will evaluate, and potentially implement, additional layers of protection at JFK Airport and our other facilities."